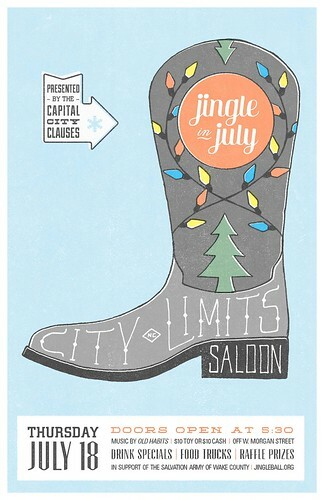 Jingle in July at City Limits Saloon July 18th! Capital City Clauses are gearing up for a great summer event this week to benefit the Wake County Salvation Army’s Christmas Cheer Program. The 2nd Annual Jingle in July is this Thursday, July 18th from 5:30-8:30pm at City Limits Saloon in Raleigh. Enjoy an evening of fun while supporting a great cause! The event will feature live music by Raleigh’s favorite Southern Roots Band, Old Habits. Food trucks American Meltdown, Chirba Chirba & Valentinos. There will also be drink specials including beer from local brewer Top of the Hill There’s even a 50/50 Raffle. Proceeds from the evening benefit the Salvation Army of Wake County’s Christmas Cheer Program and the ever growing need to provide toys to our area children for Christmas! Attendees are asked to either bring a toy valued at at least $10 or make a $10 donation to the toy buying effort. A Facebook Page has been set up for this event so you can share with your friends. Spread the word! The Capital City Clauses is a federally registered, non-profit organization comprised entirely of volunteers. Each year they host the Jingle Ball, where admission is a new unwrapped toy. All toys and gifts collected at the annual Jingle Ball are distributed to children in need through The Salvation Army of Wake County’s Christmas Cheer Program. To learn more about the annual Jingle Ball or the Capital City Clauses, please visit their website at www.jingleball.org.